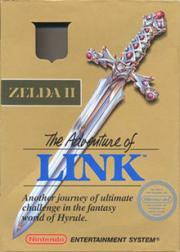 A direct sequel to the original Legend of Zelda, it follows Link as he is on a quest to break the sleeping curse placed upon Princess Zelda. A lot of good mechanics but ridiculous what they expected you to do just to beat the game. The (practically) unavoidable overworld enemies is a bad mechanic too. I used save states and enjoyed it overall, but I never would've even tried to finish it if I'd been playing it on a real console. This was certainly different for a Zelda game. It isn't a bad side-scroller as far as the combat goes. The open world is pretty solid too. It's just too scattershot to consider it a great addition to the Zelda franchise. One of the only Zeldas I've ever really liked and it probably has to do with the fact that it had that side-scroller dungeon crawling and was more of an RPG. The normal Zelda formula doesn't generally do it for me. The change in perspective may have thrown some for a loop, but it's still a solid game that remains true to the spirit of the original. Arguably, it's a more sucessful attempt to bring the series in line with then-current action-adventure practice than, say, Castlevania II. The mechanics - incorporating overworld and side-scrolling with some in-town exploration - are shockingly different than the original, which explains the well-tread, historical feeling of alienation. But like all underdogs, there's a charm in its weirdness. Worth a revisit. There is a lot of interesting ideas here in its big world and experience/level system and huge palaces and myriad of villages and secrets, but ultimately I found it very frustrating! I don't know what it says about a game's legacy when the most common refrain is "not that bad," but it, well, isn't. there's a lot to like here. in fact, there's a lot MORE to like than the first installment of the series, and the idea that this is somehow a black sheep in the franchise seems misguided when many of the more recent installments take inspiration from this more than the original game. the fluidity of the combat makes it fairly fun to this day.